Beyond the clouds of anger and revenge, don't lose sight of the eternal light. How do we stay awake, aware and compassionate in a world that seems filled with anger, violence, “fake news” and spin? How do we get to the heart of it all? I get a snapshot of world events from the things I experience as I move through each day: captions in newspapers and on magazine stands, conversations on Facebook, clips on the radio or on YouTube, and through the atmospheric vibration I touch in my daily meditation practice. I know that there have been clouds of dissension in the ethers for some time. I can see them in the media and sense them in the unseen. Over the past decade, our world has been struggling with increased local and global unrest as well as greater natural disasters. At this point in my life, I don’t feel a call to follow politics closely. Not because I don’t care—quite the opposite. I care deeply. I am simply unconvinced that the ongoing problems we face today will be solved by poring through daily news. I know, as I am sure you do you too, that in every moment, all over the world, people are violently attacked, raped and brutally murdered in wars between nations and disputes between individuals. There are millions of beings in pain right now from profound lack—not just from lack of the basics such as food, water, and shelter, but from lack of fundamental goodness, such as kindness, respect and love. We live in a beautiful, yet agitated, confused and suffering world. Political news may be more like a weather report. It shows us if the clouds of suffering or the sun of illumination are visible at any given time. It communicates if there is war or peace around the world and if people are distressed or happy. I value this information, yet I also know that clouds of suffering will always pass through as long as people have the capacity for greed, fear, rage and other painful emotions. So I don’t necessarily need to keep a keen eye on the latest events to be in touch with the world. Just as cloudy thoughts pass through my mind, clouds in the atmosphere and in people’s thinking will come and go, while the sun continues to shine. Clouds are temporary. If I focus too closely on them, I lose sight of the sun that has always been luminous, just simply out of view. This is similar to what I understand Eckhart Tolle to mean by the collective pain-body and how it is hungry. As we feed our inner pain-body by being judgmental, confrontational, aggressive or violent, or through any form of divisive thinking and finger-pointing, we in turn feed the collective or global pain-body, which is expressed through wars and other acts of unrest. This is why, beyond transitory weather reports, I am more deeply interested in that which inspires clarity of mind and compassion of heart permanently. I need this because I—like most of us—am growing and learning to become more conscious, loving and aware. I know that in order to be clear, I need to feed my mind, heart, and soul with things that make me into the most patient, kind, wise and loving person I can be. I rely on that which helps me focus on the light of the sun, so that I may imbibe its qualities and have the greatest amount of compassion to serve those who are suffering from passing clouds or torrential tsunamis. As I face the ebb and flow of daily living and witness the consequences of greed and suffering, I need to make sure that I don’t lose sight of the eternal light—our true nature. Certainly, this is what inspired me to write and produce my single “I Am Light” and its album that I am now producing, to remind us all that we are truly luminous beings, capable of tremendous wisdom and compassion. As I focus on the source that inspires true understanding and love, I do not deny the presence of the clouds, the suffering and the pain we all can feel. But I do not add to them by feeding my own inner agitation and wanting. If I were serving a drowning man, I would need to make sure that I extend a hand from solid ground. Should I jump in without that, I too will be lost in the eddy. I must stand upon the stable footing of my inner peace. I cultivate this necessary peacefulness by learning from my personal role models: spiritual leaders who do not push any particular religious belief but inspire global change through internal awareness and personal responsibility. Though we are moving through a time of dark clouds of anger and revenge on the planet as a whole, we are blessed to have access to shining inspirational lights such as Mata Amritanandamayi Devi, the South Indian “hugging saint” known as Amma; and Eckhart Tolle, the German-Canadian spiritual teacher and author of transformative books The Power of Now and A New Earth. They, among others, embody the wisdom-compassion that can bring lasting peace to the planet – if we find the humility to truly listen, learn and live from such precious, timeless teachings. We all get seduced by our mind’s desire to perceive a situation based on what we think we need. This is no criticism. It is simply our human tendency, the way our ego operates. It is how we live to some degree or another until we are enlightened and remember that only love is real. In every situation there are two sides to every story, then that which is really going on. It seems to me that we have become so busy wanting to be right that we need to side with the guy we believe has the most votes, forgetting that we all have the same seeds of ignorance and greed. Not one of us has the right to point fingers. We all have shadows and are subject to our own inner clouds. Our inner clouds create the clouds in the atmosphere. The clouds in the atmosphere affect the moods of those on the planet. No one is exempt. We are all interconnected as children of the same mother, our planet Earth. What I do affects you and vice versa. If we are transparently honest with ourselves, we come to realize that we each have cast stones of hatred and revenge – even just as passing thoughts – at some point in our lives. We all can buy into the clouds and forget the sun. We all err. We all need to make amends with ourselves, with our families, with our brothers and our neighbours. We all can learn to love better, in each moment, of every day, until we have realized that our true nature is not right or wrong – only love. How easy it is for us justify our desire to make someone right and another wrong! Pointing fingers makes us feel temporarily powerful, and that makes us feel good, as though we are on the “right” side of the fence. Yet, if another person is suffering, are we not in some way suffering too? I remember the inspired phrase There but by grace go I, which prompted me to write a song by that title that I have yet to produce, but have sung live many times. Maybe we did not bully, or throw stones, but we have the capacity to do so. We suffer if we are on the receiving end of such. We suffer when we think hateful thoughts. We must remember the interconnection that frees us from the tyranny of our ego’s need to create separateness. What is the difference between us? Is it not simply there but by grace go I? Finger pointing only highlights our reptilian brain’s need for conquest and ego feeding. The tendency to point fingers does not illustrate courage, but a weakness in the human psyche that is driven by fear. We all have fears – fear of death, fear of not being loved, fear of not enough, fear of not getting what we feel we need. Only by letting go of wants and learning to live in harmony do we truly find lasting fulfillment. There can be no external peace in our world until we experience inner peace – peace with ourselves, who we are and why we are here. As I say in my song Precious, “If I want peace in the world, I know it begins with me.” There is way too much defensiveness and not enough willingness to consider that each of us has the potential for the clouds we see in our outer world. We must find the courage to see our shared humanity and shared suffering in both sides of any situation. If you want to be a hero and inspire peace at this time of war, don’t take sides, pick up a gun or post vengeful notices. Have true courage, which means to have heart and do everything you can to not get caught up in the storm you perceive, because it fuels the storm within you, that in turn fuels our global storm. Return to the reality of the eternal light – the sun ever shining, the light of love that you truly are – and make peace with this moment. This moment is all we have. It is sacred. The love and healing you deeply seek is there. It can never be gained through wars or battles of any kind. Let us aspire to the example of great spiritual leaders such as Amma and Eckhart Tolle. Let us show true courage in the face of aggression and act only if from a place of inner peace. We can do it if we are open, ready and willing. The choice is up to each one of us. We are one Earth family. Parvati is an award-winning musician (I Am Light, Electro Yog, Yoga In The Nightclub), yogini (YEM: Yoga as Energy Medicine), author (Aonani of Avalon, The 3 Supreme Secrets for Lasting Happiness) and founder of the not-for-profit Parvati.org. All her work is dedicated to protecting all life on Earth by establishing the Marine Arctic Peace Sanctuary (MAPS). 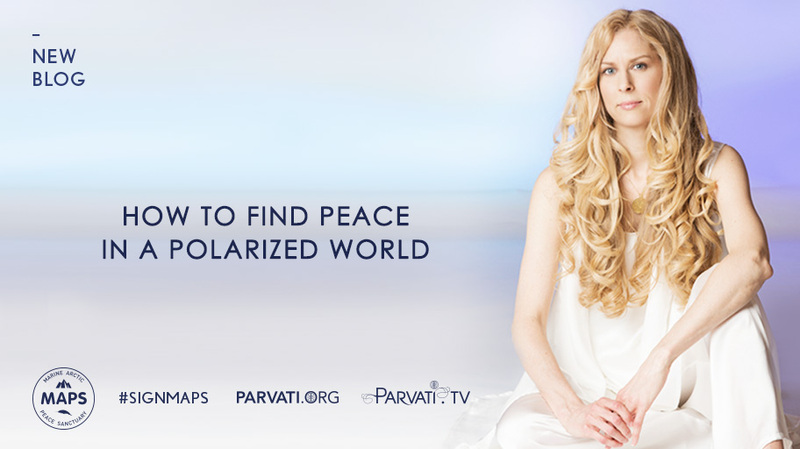 More info: parvati.tv and parvati.org.